ANNOYED that his mother was nagging at his young niece for refusing a bowl of hot porridge, Hong Kia Cheng, 47, threw a wooden dining chair at the 67-year-old woman. Another man, Koh Kim Swee, 22, was so frustrated by his mother's nagging that he whacked her on the head with a hammer in their Jurong East flat. Then there was Tan Su Ann, 39, who also took a hammer to her 79-year-old father after he tried to stop her from shouting at their maid. All three adult children were jailed between four months and two years last year for hurting their parents. Last week, a young man who kicked his 82-year-old grandmother and threatened his father with a chopper was jailed for nine weeks. 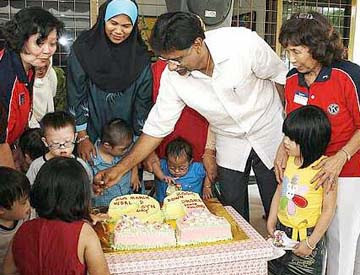 On both occasions, Seow Kok Hock, 25, lashed out because he had been refused money. More cases of parental abuse are now surfacing as mothers and fathers decide the family should not suffer in silence. 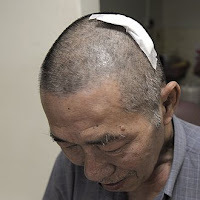 One 69-year-old man needed seven stitches after his son smashed a ceramic flower pot over his head at their Toa Payoh flat. The father told The Straits Times his 30-something son had been in and out of jail on drug offences and would hound the family for money to feed his habit. When he did not get his way, he would turn violent, once even slashing his father with a knife. The argument ending with the flower pot being thrown started because his father would not let him take $30 from his mother. Counsellors say that adult children who resort to violence often have experienced or witnessed it themselves when they were young. 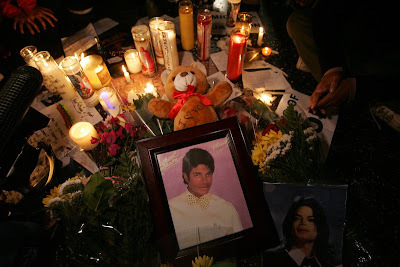 Friday 26 June 2009: a day of grief for the legions of Michael Jackson fans around the world, and here in Malaysia. I had heard the shocking news early this morning on radio. After lunch I was in the Plenary Hall at the KL Convention Centre, together with 1000+ participants from 42 countries. We were awaiting the last presentation of the 14th International Conference on Thinking. When Edward de Bono came on stage, the first thing he did was to call for a 1-minute silence as a mark of respect for MJ. A small gesture, but it showed that even in death, MJ affected people everywhere. He was someone we either loved, hated, ridiculed, vilified or worshipped. Now he's gone. Forever. The two MJ CDs I own do not qualify me as an MJ fan. 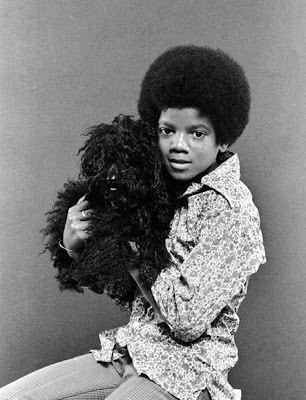 But MJ had always fascinated me. Media stories about him enthralled me. His music videos and movie "Moonwalker" mesmerized me. How could it be possible for any human being to move the way he did? Or do all those bizarre things that he did? I remember queuing up for more than two hours in the hot sun and then in the drizzle to get tickets for his concert in Kuala Lumpur. That was in October 1996. I paid RM200+ for two tickets - a princely sum in those days. Malaysians had never seen anything quite like that MJ concert at Stadium Merdeka. It was spectacular - the theatrics, the pyrotechnics and the music. We were the privileged guests at this magnificent feast for the senses. What a night to remember for the rest of our lives! I actually had goose pimples when MJ came on stage. The crowd went into a frenzy. 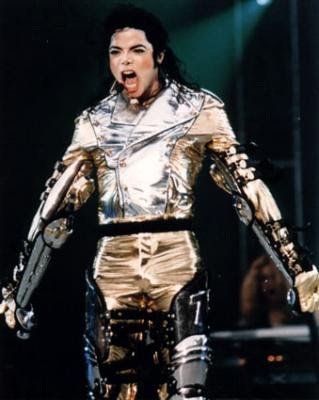 There was MJ in his silver space suit looking like a demi-god from some friendly planet, dropping by to bestow his blessings on the earthlings. "Hello, Malaysia! I love you!" he shouted, waving his gloved hand. For more than two spell-binding hours Stadium Merdeka became the centre of the universe for the thousands of Malaysians there. I am glad I got to see you in person, MJ. I am glad I had the chance to see you do your moonwalk and hear you sing "We are the World" with all those children. Thank you for all the songs and the memories. May you rest in peace. I want to share three new words I've just added to my vocabulary. The first is NEOTENY. Not all dictionaries carry this word. I like the definition I heard at Glen Capelli’s talk on ‘Successful Intelligence: Thinking Smarter in a Crazy World” at the 14th International Conference On Thinking (ICOT). As for who is Ashley Montagu? He's a world-renown American anthropologist, writer and humanist. Glen also introduced the word 'widezen', which he coined from the Japanese word 'kaizen', meaning 'continuous improvement'. Another newly-minted word is 'flexpertise' or "adaptive expertise". This word came from David Perkins, Professor at Harvard Graduate School of Education in his talk on "Educating for the Unknown". This 6-year old is truly amazing, and obviously having so much fun playing the piano. Such a joy to watch! Former PM Tun Dr Mahathir Mohamad was the keynote speaker on Day 2 of the ongoing 14th International Conference On Thinking (ICOT) at the KL Convention Centre. He spoke on Asian Leadership. His message could be summed up in two sentences: If people don’t think wisely and they choose a bad leader (e.g. Bush Jr), the country will regress, and they would be stuck with him till the next election, or worse, indefinitely, if he is a dictator (e.g. Mao Tse Tung). People must learn to make informed decisions based on data and verified sources. What interested me more was his response to a question on where he stood vis-a-vis the current controversy involving the status of the English language in our country. This is the gist of his answer. “I received my formal education entirely in English. That has not made me any more an Englishman or any less a Malay. As for teaching Science and Math in English, the objective here is not so much to help students improve their English, but more to give them access to information and knowledge. We must learn the language that gives us the widest access to knowledge. At one time, it was Greek, at another time it was Arabic. Now it is English. I’m sure what he said resonated with many people. The media was there in full force. Let’s see if this gets reported in the papers. Meanwhile, the Minister of Education has yet to make a stand on the issue. It has already been six years since Science and Math were taught in English. How much longer do parents, teachers and students have to wait before the minister finally decides? It is not fair to play twiddle thumbs with the future of our youth. WHO SAYS SENIORS CAN'T BLOG!!! (The blog below was written as my entry in a live blogging contest, so excuse the advertorial tone :-) The eventual winners were a professional photographer and a senior graphic designer. So it was ok to lose to them, lah! Congratulations to them. I enjoyed the fun experience competing alongside other bloggers, some of whom were a quarter my age! You can view the winning entry here and the runner-up. Guess it's time to retire my ole camera. at Jaya 33. The event is organized by the Association of Backpackers Malaysia in association with KASPERSKY LAB and MBPJ, and sponsored by ACER and SONY. Right now we are listening to Malaysia's top bloggers sharing with the audience how they got started on blogging and what drives them to continue. A line-up of the top bloggers in Malaysia. Can you recognize who they are? In the audience right in the front row are some distinguished silver-haired participants, including PJ council chairman Dato Wong Sai Hao. 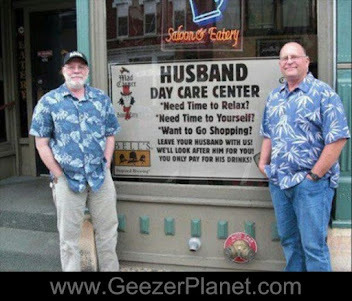 Three cheers for them! These seniors are showing that they are gung-ho when it comes to embracing the technology world. A glance around the packed room shows a majority of young people. Hmmm....looks like it's about time silver surfers and bloggers need to come forth and show the world, or at least the local community that we will be a force to reckon with in the not-too-distant future. As for me, blogging is my passion. To prove it, being the oldest contestant here at this live blogging session doesn't deter me. At stake is the grand prize of an ACER ASPIRE TIMELINE notebook. I'm on Twitter too to share my blogging experience with my followers. I do all my blogging on my old faithful ACER TRAVELMATE 3212NWXMi. Touch wood, it has never let me down all these years. Yep, my notebook lives up to its name. I literally travel everywhere with it, even overseas, together with my trusty Pentax camera. These are just about all the tools a blogger needs. Anything more is just an add-on. Let's hope this is just the beginning of more such events for bloggers. 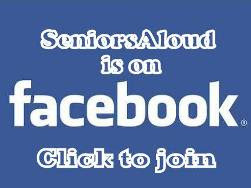 As for me, I'll be taking up the cause of encouraging more seniors to turn silver bloggers. Let's show that we are not dinosaurs in the digital world! DINOSAURS IN THE DIGITAL AGE? While I respect their wish to stay out of the cyberworld, I can’t help wondering if they are aware of the benefits they are missing out on. 1. For retirees, especially those who have lost a spouse or close friends, loneliness and boredom often set in. If nothing is done about it, the result is depression, or worse, dementia. The mushrooming of online social networking sites for the 50+ reflects the need for this age group to make new friends and find a purpose in their golden years. 2. Seniors can keep in touch with their adult children and grandchildren through email, skpe and social networks like Facebook and MySpace. In addition, they can easily view videos or family photos that are posted on these networking sites or on Youtube. 3. They can download or listen to their favourite music, read the latest news, check out share markets, find out more about things that interest them, learn a new skill or play games - all virtually on the Internet. 4. They can shop, pay their utilities bills, book tickets and plan a vacation all online. 5. Medical and health information is also easily accessible online. 6. They can start an online business and receive passive income without even leaving the house. These are just a few of the many benefits of getting online. Many social networking sites have expanded their services to include classifieds, match-making, and legal advice, while Verdurez, a new networking site for older Indians, have included forums, travel, wellness and money. 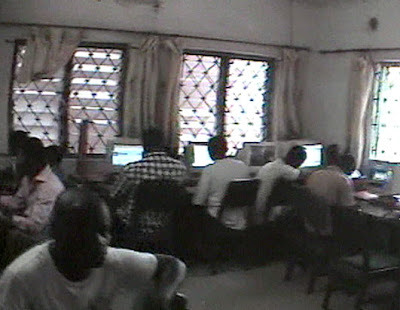 Age should never be a barrier or an excuse for computer illiteracy. Our former PM Tun Dr Mahathir Mohamad started blogging last May at the age of 83. To date, his bi-lingual blog, Che Det, has received more than 20 million hits! Many of our Ministers, including our current PM Dato' Sri Najib Razak, now have an online presence either on their own website or blog, or on Facebook or Twitter. 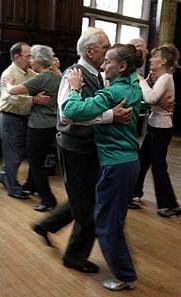 There will come a time when older seniors are housebound. That is the time when the Internet may become their only point of contact and communication with the outside world. But why wait till then? 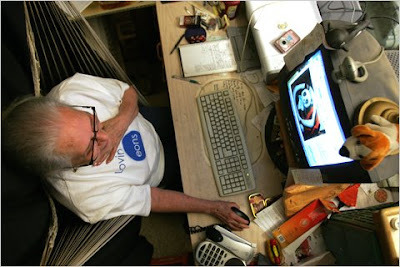 For those of us ‘younger’ seniors, the time is now to discover how the Internet can enrich our lives. 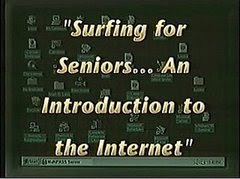 We should encourage other retirees to learn how to go online. Learning a new skill keeps the mind active and healthy. It adds years to our lives, and adds life to our years as well. Isn’t that reason enough? Of late there has been a spate of letters to the papers from retirees lamenting the lack of re-employment opportunities available to them. Citing age discrimination as the main reason, they also complain that companies are reluctant to hire them despite their wealth of knowledge, experience and academic qualifications because it’s cheaper to recruit younger professionals. However, the front page headline in The New Straits Times (15 June) tells a different story “Older talent preferred by headhunters”. Apparently, the older generation have a better command of the (English) language, are more resilient and possess qualifications on par with international standards – all of which are absent in the younger generation. The demand is high for those with experience in engineering, mining, oil and gas, infrastructure, animal health, agri-business, biotechnology, semi-conductors, water treatment, actuarial science, and investment banking. If you fit the bill, send in your applications to online recruitment companies. If you have a passion for teaching, you can always try tutoring at any of the open universities: Open University Malaysia (OUM), Wawasan Open University (WOU) or Asia e University (AeU). There are more openings for part-time tutors than for lecturers. The pay is nothing to shout about, but if money is not a big issue but keeping gainfully occupied is, then do consider this option. Alternatively, you can set up your own consultancy, or training company. But be prepared to slog the first few years to build up your company. If you can find the time, write a book and share your expertise with others. Finally, if all you want is to have an opportunity to offer your skills and services gratis to the many charities and non-government organizations (NGOs) in your community, take your pick from the list in the side bar under "Donations and Volunteers Needed". ~ volunteer activities can strengthen the social ties that protect individuals from isolation during difficult times, while the experience of helping others leads to a sense of greater self-worth and trust. ~ even when controlling for other factors such as age, health, and gender, research has found that when individuals volunteer, they are more likely to live longer. However, to receive the positive health benefits, volunteers need to commit at least one to two hours a week to volunteer activities. To quote Gen Tan Sri Datuk Zain Hashim (Rtd), MIM chairman, "It is never more rewarding than seeing that a lifetime’s accumulated wisdom and experience are put to good use at one’s golden age." At the age of 30, Chinese doctor Tom Wu was diagnosed with advanced stages of lung cancer, and was told he had only a few months to live. Not only has he survived, but the doctor has maintained a healthy life. The cancer is all gone, and he said he's never caught a cold or other illness for 40 years. He has stopped going for blood tests. "My body and feelings tell me I'm well, that I'm truly in good health," says Dr Wu. His secret lies in the power of natural healing. Dr Wu always says that no wonder drug can cure diseases. But our own internal healing power, our immune system, can. 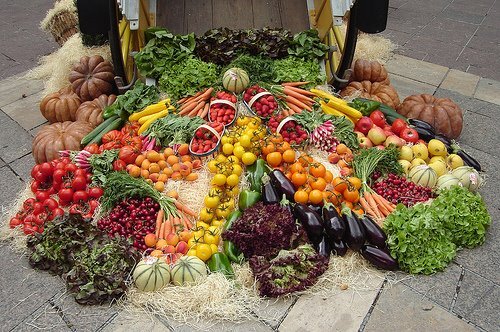 And what can strengthen our immune system are simple foods from Mother Nature, and a healthy lifestyle. In his view, diseases such as cancer, diabetes and heart disease can be overcome by changing the diet. Dr Wu says people get sick because they eat the wrong foods. Fried food, for example, causes blockage in the arteries, bad circulation, cholesterol, and heart disease. "Instead of taking a cholesterol lowering drug, I would urge them to stop eating greasy food. My suggestion is to eat clean food, which is high in phytochemicals," he says. Phytochemicals are natural cleansing agents that will help rid plaque from your arteries. They come from natural foods such as vegetables, fruits with their seeds, and common garden herbs. Phytochemicals will nourish the body's cells so they can fight against any foreign substances that invade your body. The secrets of how he won the fight against lung cancer and maintains a healthy body are revealed in his first book, Dr Wu's Principle of Natural Cures, which has recently been translated from its original Chinese version into a Thai edition, Thammachart Chuay Chewit, published by Nanmeebooks Publications. It was launched in Thailand in March this year. Dr Wu had first studied Western medicine in France, and then furthered his education in alternative therapy, earning a doctorate degree. The turning point arrived when he was diagnosed with lung cancer at the age of 30. Modern medicine gave him no hope; it was too late to remove the damaged parts of the lung. The cancer had already spread to other organs, and the doctor told him he had only a few months left. In his despair, Dr Wu picked up the Bible and prayed to God. Then the Bible fell to the floor, and he read the page it opened to carefully. The chapter talked about the days God created the Earth and everything needed for human beings. Then he created Adam and Eve, and told both of them that plants, vegetables and seeded fruits growing on Earth have been provided for them to eat. "I thought about what I had eaten in the past - meat, fish, fried and grilled food, sweet cake, but God simply wanted us to eat vegetables and sour fruits. I was confused and doubted whether I would become weak if I ate too many vegetables and less meat," says Dr Wu. Yet he decided to follow the Bible's guidance. He ate a lot of vegetables and fruits, drank clean water, and completely adjusted his lifestyle - his sleeping, breathing and exercise habits. Nine months later, he went for a check-up, and surprisingly no cancer cells were detected. 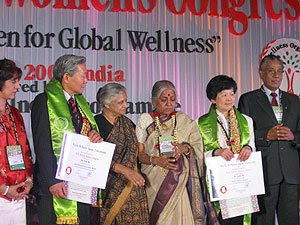 He advised people in his family and in the neighbourhood about his discovery, and studied natural medicine until he received a doctorate degree in naturopathy and nutrition from the US. Dr Wu has been a frequent speaker at worldwide forums, spreading his knowledge on natural cures and the use of organic food. He advises people to use the most simple foods in the most natural way in order to fight illnesses and maintain good health. The human body has the power to heal itself. The immune system has a self-defence mechanism to block and destroy bacteria or viruses that invade our bodies, while the self-healing mechanism will get us back on the road to recovery. When you have a cold and take medicine, the medication may kill the virus but your immune system will not fully function, and its efficiency will decrease. As a result, your body will be more vulnerable to germs. 1. Have at least three bowel movements a day. Other health experts may advise one bowel movement a day, but Dr Wu says that's not enough. You need three to four bowel movements a day in order to excrete all the accumulated faeces from your intestine. Your liver will not be overburdened and it also helps reduce cholesterol in your body. 2. Drink at least three glasses of fruit or vegetable smoothies each day. This is a way to ingest enough phytochemicals to strengthen the body's cells and immune system. Use not only the flesh, but also the skin and seeds of fruits and vegetables to make smoothies, as they are rich in phytochemicals. Most of the fruit seeds have small amounts of cyanide which kill bacteria and viruses without damaging the body. Actually the recommended smoothie diet is six glasses a day, two in the morning, one before lunch, two more in the afternoon, and one more before dinner. However, if that's too much, you may start with three glasses a day. Use a high powered blender (at least three horsepower) as it can release phytochemicals from the fibre. It's best to choose sour fruits like green or red apples, grapes, pineapples, kiwi and lime. 3. Sunbathe 30 minutes daily. prevent skin cancer, and also vitamin D that helps prevent colds, osteoporosis, and certain kinds of cancer. "Therefore, use the Sun. Expose yourself to sunlight about one-half hour a day, at noon or another appropriate time based on your local climate. The Sun will make you healthier," says Dr Wu. 4. Exercise 30 minutes a day. Don't exercise for more than 30 minutes. If you go beyond that, your body will be overworked. "If you do it more than half an hour, that will become labour, not exercise. Your heart and your body will be working too hard," he says. 5. Shower with hot, then cold water. Try an alternating cold and hot water shower: Three minutes of hot water followed by 30 seconds of cold water, then repeat twice more. This process will bring a rush of blood and energy to your body. It helps increase your immune system, blood circulation, and metabolism. 6. Drink a lot of water, in the correct way. How much water you need to drink each day depends on your specific situation. If your office is air-conditioned, drinking six glasses of water a day is enough. If your work involves lots of walking, you have to drink 8-10 glasses a day. If you work under the hot sun, then 10-12 glasses of water are required. The way you drink is also important. The correct way is to sip it little by little, to give your body cells time to absorb the water. If you drink the whole glass down at once, your cells can't absorb it all, and the water will be excreted as urine. 7. Eat according to your blood type. Your blood type determines what you should eat. Eating the wrong foods will make you sick. People with blood type O have to eat a certain amount of meat. If they eat only vegetables for a long time, their body won't absorb all the substances they need to strengthen their immune system. The recommended diet for this group is 75% vegetables, 10% fruits, 10% meat, seafood and goat's milk (avoid cow's milk), and 5% grains. People with blood type A, however should avoid milk and meat, while increasing grains and fruits. People with blood type B should also avoid meat, while those with blood type AB should avoid chicken and beef. 8. Eat according to your biological clock. Every human being has a biological clock that tells us when to eat, sleep, and wake up. If you don't follow your biological clock, the organs will lose their balance. Toxins and wastes won't be excreted from your body, and soon you'll get sick. According to Dr Wu, the biological clock is divided into three phases. From 4am to noon is the time for bowel movements, so in the morning you should eat foods with lots of fibre. Fruit and vegetable smoothies are recommended. From noon to 8pm, your body will absorb food so lunch is the most important meal. A vegetable salad with grains is recommended. Fish or boiled eggs can be added to your lunch. Avoid meat at dinner as the amino acids in the meat will disturb your sleep. Try to finish dinner by 6pm. From 8pm to 4am, the nutrients and energy from food will be distributed throughout your body organs. The golden time for your sleep is between 10pm and 2am, as your immune and self-healing system will function at its best. 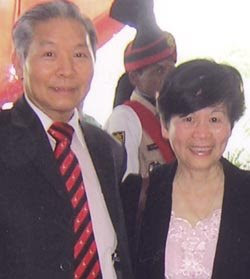 Footnote: Dr Wu was in Malaysia in November 2008 to give a series of talks. His book "Smoothie Formula" is available at Popular Bookstores. Read the original article "How Dr Wu rid himself of cancer with a vegetarian diet" by ANJIRA ASSAVANONDA. Much has been written in the media about General Motors filing for Chapter 11 bankruptcy protection on 1 June. Among the causes that helped topple the once-invincible GM were the pension bond and the retirement-trust obligation. As early as 2002, GM’s pension fund was already US$20m under-funded. GM is not the only one. Across the US, business bankruptcies jumped 40% in May alone. When a company goes bankrupt, it is legally freed from fulfilling its pension-retirement obligations to its employees. Things are no different in the public sector. Across the US, many state governments, e.g. 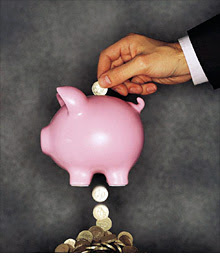 California, New Jersey and Illinois are going broke trying to meet pension payments. To raise funds, governments either have to raise taxes, or reduce employee benefits like healthcare and retirement benefits. It is the taxpayers who invariably ends up getting a raw deal. Last year 3.2 million baby boomers in the US became the first batch of retirees eligible for social security (retirement) benefits. This figure will rise when 77 million baby-boomers are expected to retire within the next five to seven years. Not only will there be 77 million fewer workers to contribute taxes, but there will be 77 million new retirees expecting monthly checks from the government. The numbers boggle the mind, and this is only the beginning. More and more countries will be facing the same predicament as their population ages. In 2005, multinational companies across the globe were already aware of the impending crisis that retirement benefits would bring on. A similar situation can be expected here in Malaysia although things haven’t quite reached such dire proportions yet. We should keep a watchful eye on our retirement funds in the EPF and keep track of the government’s investments through Khazanah Nasional Berhad. 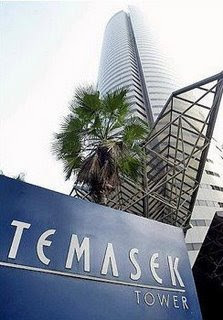 Temasek Holdings, the Singapore government’s investment arm has a website that not only lists all the companies in their investment portfolio, but also allows the public to view the group’s financial statements and balance sheets. However, what was not disclosed in the website was the massive loss of S$58 billion (US$39.91 billion) from the end of March 2008 to November 2008. 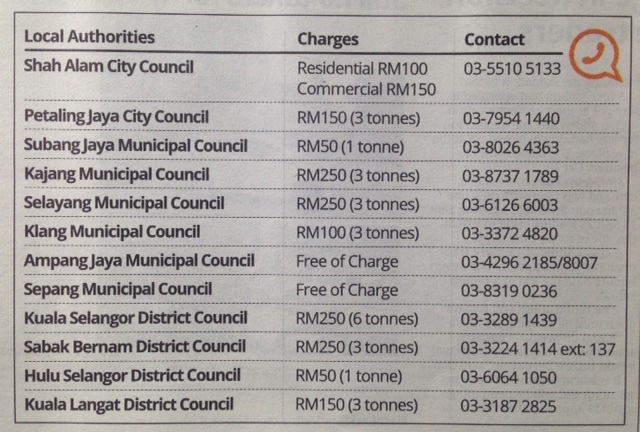 Unfortunately, there is even less transparency with regards to Khazanah’s investments. Only percentages are given, not the absolute figures. 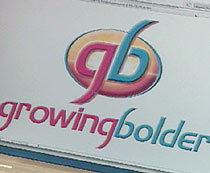 There’s also no access to the group’s financial documents. Fortunately for us, the alternative media are doing an excellent job as the people's eyes and ears. It's up to us to be vigilant about how the government spends our money. We don't want to wake up one day and find that our retirement funds have lost 70% of its value because the government has been dipping into our EPF savings to bail-out sick companies that they had invested in in the first place with taxpayers' money. 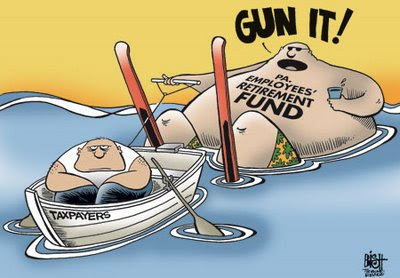 We simply cannot remain passive bystanders when our retirement benefits are at stake. Having gone through a couple of failed relationships, I am certainly in no position to counsel the soon-to-be-(re)married or the soon-to-be-divorced. 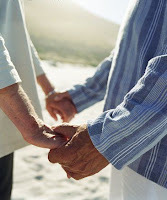 For those among us seeking to revitalize their marriage or contemplating a second marriage, here is some advice from marriage and family therapist, Dov Heller. Here are five questions you must ask yourself if you're serious about finding and keeping a life partner. QUESTION 1: Do we share a common life purpose? Why is this so important? Let me put it this way: If you're married for 20 or 30 years, that's a long time to live with someone. What do you plan to do with each other all that time? Travel, eat and jog together? You need to share something deeper and more meaningful. You need a common life purpose. Two things can happen in a marriage: you can grow together, or you can grow apart. 50% of the people out there are growing apart. To make a marriage work, you need to know what you want out of life! Bottom line - marry someone who wants the same thing. QUESTION 2: Do I feel safe expressing my feelings and thoughts with this person?This question goes to the core of the quality of your relationship. Feeling safe means you can communicate openly with this person. The basis of having good communication is trust - i.e. trust that I won't get punished or hurt for expressing my honest thoughts and feelings. Make sure you feel emotionally safe with the person you plan to marry. QUESTION 3: Is he/she a mensch? A mensch is someone who is a refined and sensitive person. How can you test? Ask about your significant other: What do they do with their time? Is this person materialistic? 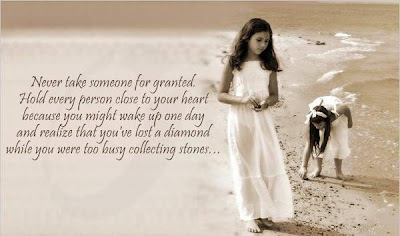 Usually a materialistic person is not someone whose top priority is character refinement. There are essentially two types of people in the world: people who are dedicated to personal growth and people who are dedicated to seeking comfort. Someone whose goal in life is to be comfortable will put personal comfort ahead of doing the right thing. You need to know that before walking down the aisle. QUESTION 4: How does he/she treat other people? The one most important thing that makes any relationship work is the ability to give. To measure this, think about the following: How do they treat people whom they do not have to be nice to, such as waiters, bus boys, taxi drivers, etc. How do they treat their parents and siblings?Do they have gratitude and appreciation? You can be sure that someone who treats others poorly, will eventually treat you poorly as well. QUESTION 5: Is there anything I'm hoping to change about this person after we're married? Too many people make the mistake of marrying someone with the intention of trying to improve them after they're married. 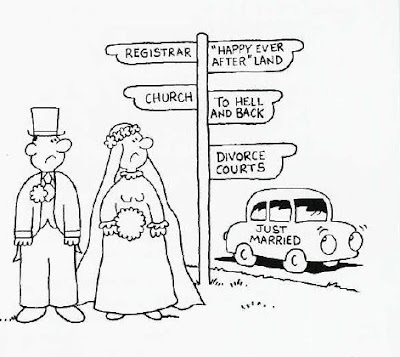 As a colleague of mine puts it: 'You can probably expect someone to change after marriage for the worse'. If you cannot fully accept this person the way they are now, then you are not ready to marry them. Both you and your spouse need to make a commitment to do the following: DON'T CAUSE PAIN, GIVE PLEASURE. Here are a few reasons why more people aren't applying this principle. First, most couples are simply not aware of this principle. There's so much written on the subject of relationships that everything is made to sound so complicated. Indeed, making things more complicated than they have to be is a basic problem of human nature. Secondly, to apply this tool requires a conscious effort and much work. People often say that you have to work at marriage. But most people don't really know what that means. If you and your spouse commit to working on this tool, you both will come to understand the meaning of "working at a relationship." Thirdly, to apply this tool successfully, you have to want to be a giver rather than a taker. Marriage is a great reality test. A giver is someone who is committed to minimizing causing others pain and maximizing giving others pleasure. Are you a giver? In general, monitor closely how you talk to your spouse and don't let either one of you get away with saying anything that is hurtful or unkind. Point it out immediately. You should never accept any form of abusive treatment. Don't speak disrespectfully. Don't boss, give orders, make demands or be rude. Often we think because we had a bad day or because we are under a lot of pressure, that we are entitled to take it out on our spouses. Try to catch yourself the next time you feel like being abrupt or demanding remember to keep your mouth shut until you can speak nicely. Watch your tone of voice. If you speak to your spouse with irritation or annoyance in your voice, you are giving your spouse pain. Don't criticize, put down, or ridicule. Never embarrass your spouse in public. If you must give your spouse some constructive criticism, don't do it on the spot. Wait two days before you bring it up so that you can be sure to be saying it without anger or an edge in your voice. Watch your facial expressions. Looks can kill! What’s amazing is that so many spouses do not have a complete picture of what their spouse likes and doesn't like. So sit down with your spouse and get a list of all the things that give him or her pleasure and do one of these things every day. Smile a lot at each other. You'd be amazed at how much pleasure you can give each other by being conscious to smile as much as possible. Before you say or do anything, ask yourself this question: "Will this bring us closer together or push us further apart? If it will bring you closer together, do it, if it will push you further apart, don't do it. Always ask, "What can I do for you?" Look for ways to help each other. They are always there, if you open your mouth and ask you'll be sure not to miss them. Have an honesty meeting once a month. Tell each other how the other is doing in both the pain and pleasure departments. The goal is to get feedback so you can improve upon your effort. Lastly, it is crucial that, every day, you recommit to the goal to give pleasure and not cause pain. Great marriages are truly built one day at a time! Some people just don’t seem to learn. Despite repeated media reports about Malaysians falling prey to all manner of scams and frauds, there are people who find the lure of easy money too tempting to resist. 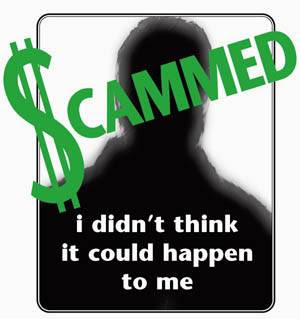 Some of these scams are so obvious, yet there seems to be no lack of victims. According to statistics released by the police, Malaysians have been conned of a staggering RM20 million over the past few years by African fraudsters. Most of the victims are professionals such as lawyers, accountants and academicians. You would think these folks should know better! These con men never give up. One of my email inboxes is 90% stuffed with spam, mostly scam letters. I’ve long given up using this email account except to keep abreast of the latest scams going around. Here are some recent samples I’ve had the displeasure to receive. We are delighted to inform you of your grant award release on the 22th May 2009 from the Barclays Premier League Grant programme. You hereby have been approved a sum of £1,000,000,00.GBP in cash credit…. I wish to notify you again that you were listed as a beneficiary to the total sum of $11,000,000.00 (Eleven Million United states Dollars) in the codicil and last testament Of the deceased (Name now withheld since this is my second letter to you).Please get back to me ASAP so as to get this done immediately…. We encountered a problem with our database and a lot of records were lost, we are restoring our database to enable us serve you better. Your Gmail Team Account details are required so as to store in our database to keep your account active. Failure to do this will lose his or her account permanently…. This one below is my all-time favourite for its creativity – worthy of the grand prize in story-telling. I am Lady Ruth Latsis suffering from cancerous ailment. I am married to Sir Silas Latsis, a shipping tycoon notable for his great wealth, influential extended family, and charitable activities all his life before his death. Our life together as man and wife lasted for three decades without child. My husband died after a protracted illness in April 17, 2005. When my late husband was alive he had a lot of investments in the capital market (stocks and bonds valued at over $5 Million). Consequent upon his demise this stocks were transferred solely to me. Recently, my Doctor told me that I have limited days to live due to the cancerous problems I am suffering from though what bothers me most is the stroke that I have in addition to the cancer. With this hard reality that has befallen me, I have decided to distribute this stocks to persons in need, orphanages and motherless babies homes. I have chosen you as one of the beneficiaries hence, I have decided to give you $5 Million worth of my stocks and I want you to use this gift which comes from my husbands effort to better your lot, fund the upkeep of widows, orphans, destitute, the down- trodden, physically challenged children, barren-women and persons who prove to be genuinely handicapped financially around you. It is often said that blessed is the hand that giveth. I am not afraid of death hence I know where I am going. I do not need any telephone communication in this regard due to my deteriorating health and because of the presence of my husbands relatives around me as I am currently bedridden in the Family house and do not receive any visitors unless approved by the immediate younger brother to my late husband. I do not want them to know about this development in order to safeguard this bequest. where I will include your name as one of my beneficiaries. My happiness is that I lived a life worthy of emulation. 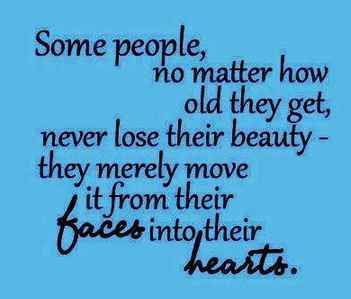 Please always be kind hearted all through your life. I want you to immediately contact my Attorney through his email gavanconnolly001@live.com and provide for him all that he may require to finalize this arrangement, please make sure to maintain a confidential and Cordial relationship with him even in my absence because he is a very Trust worthy and caring person. Please assure me that you will act just as I have stated herein. Hope to hear from you soon, it is well with you and members of your family. Ensure to keep this very confidential for security reasons until the funds are safe in your possession. Be alert to such online scams. Be suspicious of anyone promising easy money or promoting get-rich schemes. Think twice before you purchase any product that guarantees 100% results. There’s no such thing as a free lunch unless you truly deserve it. Money isn’t the root of all evil. 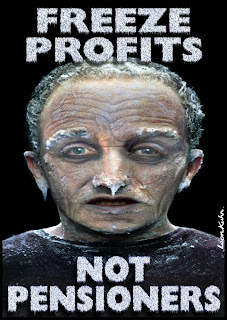 Greed always is.